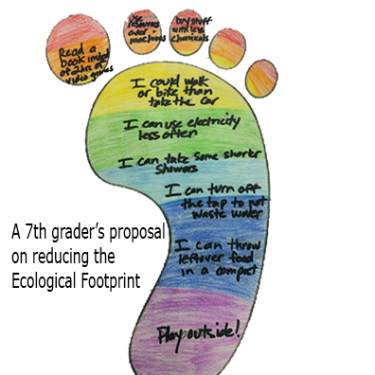 Footprint Drawing: Suggest ways to reduce your Ecological Footprint in a drawing like the one by the seventh grader at left. Create your own activity: Email us at socialmedia@footprintnetwork.org to tell us what you will do about your Ecological Footprint. Footprint Futures, a university-level curriculum for exploring the sustainability challenge facing human economies, from Global Footprint Network. “Teaching with Ecological Footprints” curriculum from Vanderbilt University Center for Teaching. Kid-friendly article on the Ecological Footprint, with link to Footprint calculator for children, from KQED Quest. A hands-on, inquiry-based, curriculum for year 9 or year 10 students on global warming and renewable energy from the Australian Academy of Technological Sciences and Engineering. German website on nature and the environment for children from Bundesministerium für Umwelt, Naturschutz, Bau und Reaktorsicherheit (BMUB). Weekly teaching lessons (in German) on timely environmental topics from BMUB. Downloadable classroom materials (in German) on environmental topics, including biodiversity, renewable energy, and climate change, from BMUB.